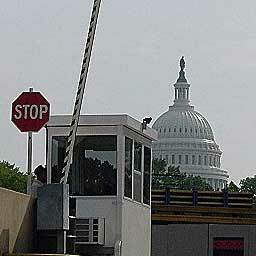 Title: NEW HOMELAND SECURITY GUARD POSTS GIVES CAPABILITY OF ERECTING CONCENTRATION CAMPS VERY, VERY QUICKLY! Subtitle: With the Patriot Act giving Federal officials the dictatorial authority not seen since the days of Communist Josef Stalin and Nazi Adolf Hitler, we all look earnestly to stories that concentration camps are being built. This new guard post gives authorities the ability to throw up new camps literally overnight! Signs of the impending dictatorship are everywhere for the discerning person to see and to understand. Since President Bush announced the Homeland (Deutschland) Security Department as a means by which to fight a terrorist enemy that the Illuminati had created, we have repeatedly warned of the hideous nature of this organization whose only purpose of existence is to be the means by which to clamp down severely on individual Americans, taking away our liberties and dissolving our Constitutional form of government. As we begin this discussion, please remember that those nasty old militant Muslims are not the only targets of the Bush Administration; by the very nature of the organization of Homeland Security, by the very nature of the police state laws given Bush already by Patriot Act I and the many more demanded by Patriot Act II, and by the very nature of Attorney John Ashcroft's concentration camp plans, we individual Americans are the ultimate target. The Antichrist can only arise after the American elective government, Judicial System, and our Constitution are dissolved. NEWS1739 -- WE CAN NOW SEE THE HIDEOUS, OCCULT FACE OF PRESIDENT BUSH'S HOMELAND SECURITY AGENCY, THE U.S.A. PATRIOT ACT AND ALL OF ITS SUPPORTING LAWS! This article, above, details the exceedingly powerful Satanic symbolism contained within one of the more troubling departments now reporting to Homeland Security, the "Information Awareness Office" or Defense Advanced Research Projects Agency, [D.A.R.P.A.] , headed by the formerly disgraced Admiral John Poindexter. This organization is specifically designed to gather and catalog extremely detailed data on each and every citizen of this country so that, at the right moment, the government may use that information to enslave us all. Our Founding Fathers were very aware that anonymity of the private citizen is absolutely required if individual liberties were to remain secure. Current electronic information that now governs nearly all of us is now about to be turned against us by the very government sworn to protect us. All we need is the next great emergency! NEWS1495 -- FEDERAL EMERGENCY MANAGEMENT AGENCY -- AT THE FOREFRONT TO RULE AMERICA IN A DECLARED NATIONAL EMERGENCY! Past Presidents have positioned FEMA to rule dictatorially should the President declare a national emergency. The head of Homeland Security will now wield those powers. With these articles as background, you should be better able to understand the significance of this new technology which will allow Federal authorities to quickly build new concentration camps, not having to rely upon elaborate steel structures which take a lot of time to build. We have read many reports of new prisons being built which are empty, but that is really beside the point, since we now realize how quickly Homeland Security can set up these new guard posts and string concertina wire between them. Let us first examine the write-up on the Park-ut website, as a basis for our discussion. The pictures of the guard booths they show can obviously be used both for civilian and military applications. However, three of them caught our attention. Notice the coiled barbed wire that can be affixed to this tower. As a point of reference, I believe coiled barbed wire can be affixed between any of these "bullet-resistant" towers. This type of tower is precisely the kind of tower the Illuminati would use to form the security points of a quickly-built concentration camp. When the planned panics do hit, and authorities on the local, state, and federal level begin arresting people who are on one of their "enemies' list", a lot of extra concentration camp space will be needed, and quickly. 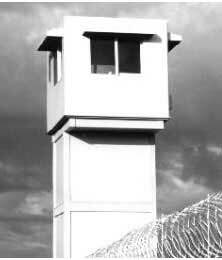 This portable, "bullet-resistant" tower will enable authorities to almost instantly create new prison capacity for people who have been declared "enemy combatants" and can be held indefinitely without charges, without legal representation, and without any possibility of a fair, impartial trial. "A major luxury car manufacturer in Detroit wanted to have an elevated security station to watch over a new car storage lot. What they specified was an 8' x 8' PAR-KUT building and a 10' tall structural steel platform. This allowed for the security guard officers to see the entire surface lot as well as between the stored cars and beyond the fences. The steel platform was designed to allow the factory assembled PAR-KUT building to fit snugly within the top angle. The anchor clips on the booth extended downward to allow for through bolting into the steel platform. The two sided exterior stairway had a mid level landing as well as the top level porch. 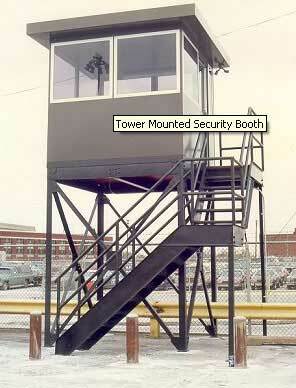 This type of security platform would be ideal for a major command and control center in a concentration camp setup. This type of platform would provide "an elevated security station to watch over a new [prisoner outside) lot" over which guards would be able to watch everyone in the yard. "Par-Kut realizes that changing times demand improvements in all levels of homeland security. This photo depicts an inspection booth located on the outskirts of the capital. The installation allows security personnel to regulate access to highly restricted areas. Par-Kut continually improves manufacturing processes, available options, and sales knowledge to meet the needs of homeland security. Security booths for parking lots and structures are just as important as applications for border crossings and port entrances, and other high-level security locations. The uses to which this type of bullet-resistant security post could be utilized seem almost endless. This is the type of security platform which would be used to secure roadways and access into and out of security areas, such as a quickly-built, temporary concentration camp. Several millions of Americans will ultimately be declared "enemy combatants" and incarcerated. New Age author Bill Cooper states that, even if a person has joined a church, or declared to the IRS a tax deductible amount to a church, or if they have subscribed to the wrong magazine, they will be rounded up. "The solution of today's problems requires an approach which is ruthlessly candid, with no agonizing over religious, moral, or cultural values." 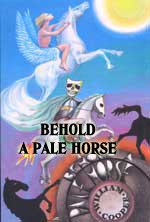 ["Behold A Pale Horse", p. 37] This statement tells you of the ruthless heart of our leaders, for they are being commended for their heartlessness and ruthlessness. Now, can you understand how important it was that our current President is an unrepentant member of the Satanic Skull & Bones secret society? '... benevolent' slavery and genocide." If you have difficulty in thinking how a dictator and his soldiers could look at incarceration and murder as "benevolent", you need look no further than Adolf Hitler and his vision of an Aryan Germany "purified" of the Jewish taint to their blood. As Robert J. Lifton so eloquently notes, the Nazi vision turned values upon their heads. Murdering Jews was looked as positive because such carnage was "cleansing" and "healing" the nation. Likewise, the Illuminati truly believes they will be "cleansing" and "healing" Mother Gaia (Mother Earth) from her plague of the Industrial Civilization, from over population, and from pollution caused by both forces. Only by reducing the world's population by two-thirds (the same proportion of God's Revelation judgments upon mankind) can they return Earth to her rightful state of "balance". Killing to heal. 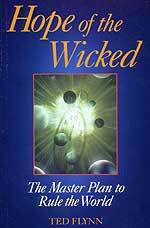 That was the Nazi plan, and it is the plan of the current Illuminati as they drive toward Antichrist. Most people have trouble accepting this horrific realty, for they have allowed themselves to be conned by the positive public rhetoric, and they prefer not to know the truth. Nothing speaks more clearly to the issue of the final end the Illuminati has planned for their enemies than these arrogant and heartless statements, quoted above. The End of the Age is truly upon us, as the "enemy of our souls" is patiently gathering his forces for the final assault on the Old World Order so the new Luciferian values can be brought to public expression. Can you hear the approaching hoofbeats of the Four Horsemen of the Apocalypse?